Grenadian fishermen prepare to head out to sea. They say they have been catching less fish and their livelihoods are threatened by climate change. 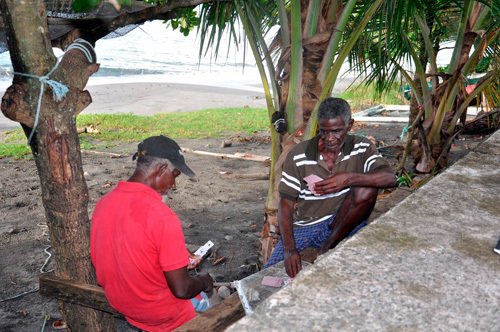 Grenadian fishermen Henry Prince (right) and Ralph Crewney see beachfront living as a virtual birthright, despite the risks posed by climate change. Henry Prince has lived in this fishing village for more than six decades. 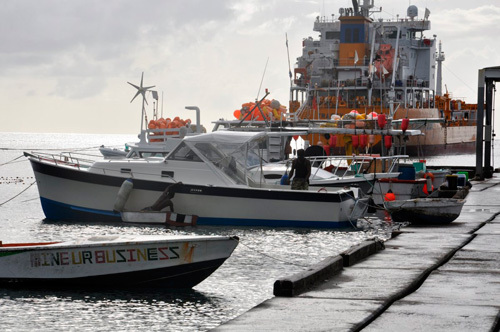 Prince, 67, who depends on the sea for his livelihood, said he has been catching fewer and fewer fish, and the decrease is taking a financial toll on him and other fisher folk throughout the island nation of Grenada. While storms and beach erosion have long shaped the geography of coastal environments, rising sea levels and surge from more intense storms are expected to dramatically transform shorelines in coming decades, bringing enormous economic and social costs. The hurricane killed 28 people, caused damage twice the nation’s gross domestic product, damaged 90 percent of the housing stock and hotel rooms and shrank an economy that had been growing nearly six percent a year. By caribbeanclimate in 5Cs in the News on May 6, 2015 .